Weight training exercises for the elderly that increase mobility and improves arthritic conditions. Don't get older, get stronger in this medically-approved strength training fitness DVD for older adults. Do you find yourself saying, "I'm not as young as I used to be?" Don't you really mean, "I'm not as strong as I used to be?" Don't get older, get stronger in this medically-recommended strength training workout DVD for older adults. This DVD is ideal for any person that thinks they are aging and can't do the things they used to do (like run). It isn't recommended for any specific age, but many of our customers that buy this workout DVD are baby boomers age 55 and over. Many of our customers also buy this product for their parents. If you have an elderly friend, parent or grandparent that is losing strength and flexibility because of aging, or has arthritis or osteoporosis, this would make an ideal gift. Francesca Fisher and four of her students perform this 47 minute workout. All that is required is a chair and a set of 2-pound dumbbell weights (or heavier if you prefer). You might also want to use an exercise mat or towel for the exercises that are performed on the floor. 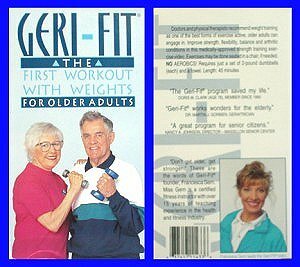 If you're looking for an exercise video that doesn't have floorwork, see our Geri-Fit Greatest Generation Workout dvd. The first workout with weights for older adults was developed with the help of geriatrician, Dr. Martin J. Gorbien, formerly of the Cleveland Clinic Foundation. This DVD features fitness expert Francesca Fisher and four of her students ranging in age from 50 to 72. This workout requires just a set of 2-pound (each) dumbbells, a towel or stretch band, and an exercise mat or carpeted area. The exercises may be performed seated in a chair, if needed. Even if you are disabled, handicapped, or confined to a wheelchair, this workout can still be performed. If you have more than 50 pounds to lose, this workout will at least get you moving so that you burn calories more effectively. Your clothes will soon fit looser in no time. Stick with it until you are ready to graduate to the next level or you can just use heavier dumbbells. There is absolutely no aerobics or dance choreography to learn. Superimposed graphics will explain and depict how each exercise is performed before it is actually performed on the DVD. You'll appreciate the filmed-at-one-time-setting so that when you see that we can do it, you'll know that YOU can do it. For best results, perform this workout until you have built up enough strength to graduate to using one or more of our other strength training fitness DVDs. We offer stretching workouts, pilates and other body part workouts. So what are you waiting for? Isn't it time to turn back the hands of time? Get with the program... Geri-Fit® - strength training workouts done with dumbbell weights... the easy way to get in and stay in shape forever! If you are purchasing any of our DVDs to play in a public setting like a senior center, health club or other public building, you will need to also purchase a PPL License (Public Performance License.) Since the DVDs that we sell are for private in-home use only, your center must be appropriately licensed in order to display the video content for public broadcast. By paying the nominal license fee, you will be in full compliance with Federal copyright laws. This is a one-time fee of $150 per DVD title. Each Public Performance License comes with its own PPL certificate to display in your workout area. To purchase a PPL License, click on this link.